(Bloomberg) — Go inside the global economy with Stephanie Flanders in her new podcast, Stephanomics. Subscribe via Pocket Cast or iTunes. European Central Bank policy makers are in no rush to revamp their negative interest-rate policy despite Mario Draghi’s suggestion to look at the matter. With two days to go before the institution’s April decision, the president’s call to “reflect” on softening the impact on banks has spurred limited action aside from a public debate. ECB committees, whose work is often the basis for formal policy proposals, didn’t discuss the matter in the week or so since his speech, according to people with knowledge of the matter. Euro-area bank stocks extended their decline on the news. The Euro Stoxx Banks index was down 0.8 percent as of 1:27 p.m. Frankfurt time. The Governing Council may also need time to develop more of a consensus. Some officials are still convinced that the benefits of a deposit rate below zero outweigh the drawbacks and see no need to redesign the policy, said the people, who asked not to be identified. While the effects of sub-zero rates have long featured in Governing Council debates, Draghi’s comment took several policy makers by surprise, and speculation that a measure might be imminent left some irritated, according to the people. Among their concerns is that an alternative that exempted some funds from the policy would challenge the ECB’s guidance by signaling that interest rates could stay low for much longer than currently indicated or even be cut. An ECB spokesman declined to comment on the ECB’s discussions on monetary policy. ECB officials are poised to gather in Frankfurt on Tuesday before their monetary policy decision on Wednesday, after which many of them will promptly leave for the International Monetary Fund meetings in Washington. Since Draghi spoke, officials have disagreed in public on his call to look at negative rates. The French and Austrian governors both applauded Draghi, while Chief Economist Peter Praet said cautiously that any change would need to be justified under monetary policy grounds. Praet’s colleague on the Executive Board, Benoit Coeure, insisted that the bank-lending channel is “fully operational,” while Dutch Governor Klaas Knot said the ECB should “stay far away” from any move. Sub-zero rates cost euro-area banks more than 7 billion euros ($7.9 billion) in profit every year. 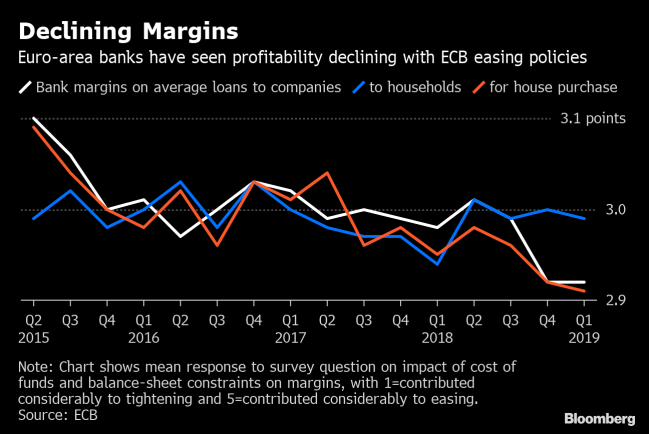 A couple of days after Draghi spoke, Societe General SA chairman and former ECB Executive Board member Lorenzo Bini Smaghi said that the policy “basically is a tax” on bank profitability. “We are now realizing that when you run negative interest rates for a long time, you undercut the ability of the financial sector to provide credit,” Mohamed El-Erian, chief economic adviser at German insurer Allianz (DE:ALVG) SE and a Bloomberg Opinion columnist, said on Bloomberg Television on Friday. Of central banks that operate a negative rate policy, three try to cushion the blow with a so-called tiering system that exempts some funds from the charge. The ECB decided against that in 2016 when it lowered its deposit rate to the current minus 0.4 percent.